It is easy to fall in love with Oaxaca. This charming colonial city situated in a valley surrounded by magnificent mountains has everything to offer the visitor who wants to experience “authentic” Mexico. Because it is home to sixteen indigenous groups, it boasts an extraordinary variety of traditions, costumes, folk art and cuisine. Understandably, the United Nations has designated it a UNESCO World Heritage site. Oaxaca is a feast for the senses. Art is Oaxaca. It can be seen in the numerous galleries and museums such as the Rufino Tamayo, which displays the native artist's personal collection of Mesoamerican art, to the new Museum of Textiles, and the recently renovated Museum of Contemporary Art. Art is in the streets of Oaxaca, so one is never surprised to come across an installation of sculptures on a street corner or a concert in the park. All is within blocks of the bed and breakfast. The markets of Oaxaca and the villages of the valley are where you see the real life of the people as everyone comes together to buy, sell, and have a meal. The B&B is lucky to be located just a couple of blocks from La Merced, one of the city's best small neighborhood markets. The mole tamales are a must! There is also a weekly organic market that guests consider a ritual and sooner or later you will want to hop on a bus or collectivo for the Sunday market at Tlacalula where you can bring home everything from a live turkey to a bottle of mezcal to a beautiful piece of pottery. And there is the history of one of the richest cultures that has ever existed. 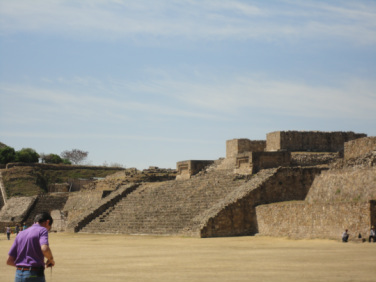 A visit to Monte Alban on a hilltop high above the valley takes the breath away. Nearly 30,000 inhabitants lived in and around this site at one time and it ruled the valley for centuries. Other sites, such as Mitla and Yagul, show the marks of similarly developed, thriving cultures. A student from the Center often is available to be a guide to help you understand this deeply meaningful part of their heritage. As for the million-dollar question—is it safe?—we can assure you that Oaxaca is safer than most major cities anywhere. It is far away from the border towns where the drug problems are. If you use proper precautions (such as staying off the streets at 2 am, leaving your expensive jewelry at home), you can feel as comfortable here as you do at home. Just bring comfortable shoes and beware of the occasional holes in the sidewalks!